There is something magical about brunch. Maybe because it’s the best of both worlds— breakfast and lunch. Brunch allows you to choose from all the classics. Are you ready for a hearty omelet or some fluffy waffles? Maybe instead you’d like a fresh salad or sandwich. Here are the 10 best brunch places in Maine. Mimosa anyone? Bayside American Café, formerly known as Bintliff’s American Café, has been the number one spot for brunch in Portland since 2003. While many restaurants only serve brunch on the weekends, Bayside American café serves it every day. Favorite items include their Lobster Frittata, custom omelets, and Belgian waffles. Get there early as there is often a wait time. No visit to Acadia National Park is complete without a stop for brunch and popovers at the Jordan Pond House. While there is no official brunch menu, you can certainly enjoy a delicious brunch-like menu with choices like popovers, salads, and seafood chowders. Prosecco and popovers sounds like the perfect brunch to us! Sonny’s Restaurant & Bar serves brunch every weekend from 10 a.m. to 3 p.m. While the Mexican-inspired brunch menu has some awesome food options, it’s really their $5 Mimosas and Bloody Marys that makes Sonny’s one of the best weekend brunch spots in Portland. The Sinful Kitchen is a small restaurant on the Portland/Westbrook line that truly serves up a sinful brunch menu. Choose from hearty savory dishes like El Diablo Plate and huevos rancheros or sweet dishes like the waffles and stuffed French toast. Brunch is served seven days a week and the waffles are truly to die for at the Sinful Kitchen. Located in a beautifully designed nautical restaurant, the Royal River Grill House serves up a pretty mean Sunday Brunch menu. The menus are seasonal and feature plenty of Maine specialties like lobster and hand-cut steaks. You’ll want to try their house special, the Royal Mary, that is topped with shrimp to wash down whatever delicious item you choose from the brunch menu. A deli isn’t the first place you’d think to go for brunch, but if it’s Big G’s then it’s the place to be in central Maine. This deli has a 200-seat restaurant that serves up some pretty epic breakfast and lunch food making it the perfect spot for Sunday Brunch. The portions are huge so bring your appetite. Only in Maine would you ever go to a truck stop for brunch. Open 24/7 in both Bangor and Hermon, Dysart’s knows a good breakfast menu. 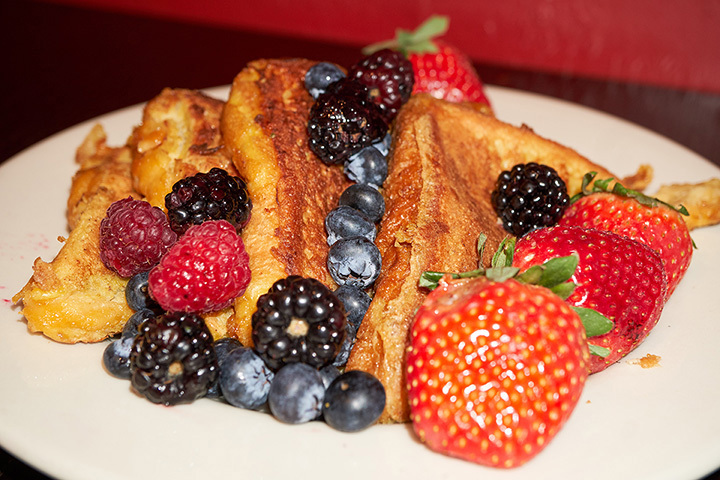 You’ll be full all day long after ordering one of their signature breakfast dishes. The food, especially the pork, is locally-source from a nearby farm so you know the bacon is fresh at the Thistle Pig in South Berwick. Their large brunch menu is a great mixture of savory dishes, like goat cheese & roasted winter vegetable omelet, and sweet dishes, like blueberry waffles. Don’t forget to order a cocktail to go along with your meal! This cozy family-run restaurant is a longtime favorite of the western Maine communities. You’ll find a hearty menu of all the brunch favorites like eggs, omelets, and French toast. If you’re looking for something on the lighter side, try one of their many fresh baked goods, like scones, muffins, and bagels. The Front Room on Portland’s Munjoy Hill is one of Portland’s favorite brunch spots. Get there early as there is often a long line out the door. Their brunch menu is the perfect mix of traditional favorites like biscuits & gravy and creative dishes like the savory brioche French toast. The potato gnocchi is a personal favorite.